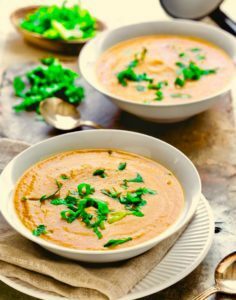 It is fall, and that means it’s time to indulge in warm, comforting bowls of soup made from healing pumpkin and bone broth. Pumpkin is a wonderful source of dietary fiber and a powerhouse of vitamins and minerals. It contains many antioxidants, particularly beta-carotene which is essential for maintaining the integrity of the skin and mucous membranes and essential for optimal vision. The bone broth will support you gut and immune system and then some. Reduce the heat to simmer and add coconut milk and ginger.